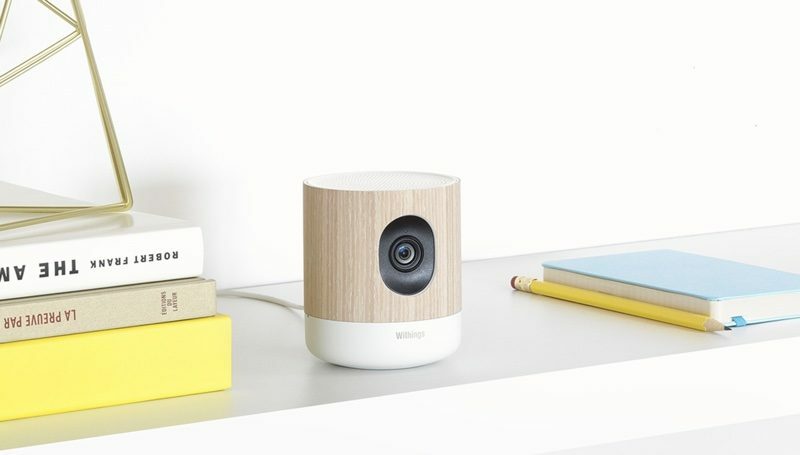 At this week's Consumer Electronics Show, Withings introduced the next-generation version of its "Home" smart security camera and baby monitor, which adds HomeKit compatibility. The new "Home Plus" is one of the first security cameras on the market to integrate with HomeKit, allowing it to interface with other HomeKit-enabled products and be accessed through Apple's own Home app. Like many security cameras on the market, the Home Plus streams HD video to a smartphone or tablet, allowing users to keep an eye on their homes when away, or on their children when in a different room. The Home Plus sends notifications out when there's unusual noise and movement, and it's able to monitor indoor pollution. Design wise, the Withings Home Plus looks similar to the original Withings Home, introduced in 2015, with a wood enclosure and white accents that house a wide-angle camera. It has the same HD camera with night vision support and the ability to store video for up to 48 hours with no subscription plan needed. Withings plans to make the Home Plus available for purchase during the first quarter of 2017. It will be priced at $199. Withings has also begun selling its new Withings Steel HR, an analog fitness tracking watch with a built-in heart rate monitor. First introduced in September, the Withings Steel HR looks like a traditional watch, but features heart rate and activity tracking. The Steel HR is available for $179.95 to $199.95 from the Withings website. For the same price, the Nest indoor camera is a better option, I'd say -- especially when you can usually pick the Nest Cam up for less than $199 on Amazon or on sale somewhere. Nest also requires a subscription to store video in the cloud; but it offers a 10-day option as a minimum, which, to me, is more useful than 48 hours. I know some people don't need or want 10 days worth of video stored in the cloud, though. We use the Nest Cam in conjunction with a baby monitor app that works over Wi-Fi or Bluetooth. We have the baby monitor app set for audio only and have it running on an old iPad that isn't useful for much more than a baby monitor these days anyway. We do it that way because the Nest app doesn't continue to stream audio when the app is in the background, unfortunately. The setup works very well for us. I'm still not sold on HomeKit. All it takes is for Apple to decide to change the standard and suddenly, all this HomeKit-compatible stuff could be rendered not HomeKit compatible any more. Sadly, I no longer trust that Apple wouldn't do something like that -- and then call it "courageous", to boot. Any news on the D-link Homekit camera that was announced to be available end of last year? Will it also be presented at CES? The fact that this is compatible with Home Kit would separate it from the other competitors. Other vendors could drop support too just as easily. Homekit requirements are very strict, so if something supports Homekit, most likely it supports Alexa, Google, SmartThings, etc. I refuse to buy non Homekit smart devices because I want to have everything be accessible through the Home app. Homekit is also very secure providing full encryption,.... which is what you'd defintely want for a security cam. Reviews of Withings current gen camera seems sub par. HomeKit support interests me though. We use the Nest Cam in conjunction with a baby monitor app that works over Wi-Fi or Bluetooth. We have the baby monitor app set for audio only. We do it that way because the Nest app doesn't continue to stream audio when the app is in the background, unfortunately. The setup works very well for us.